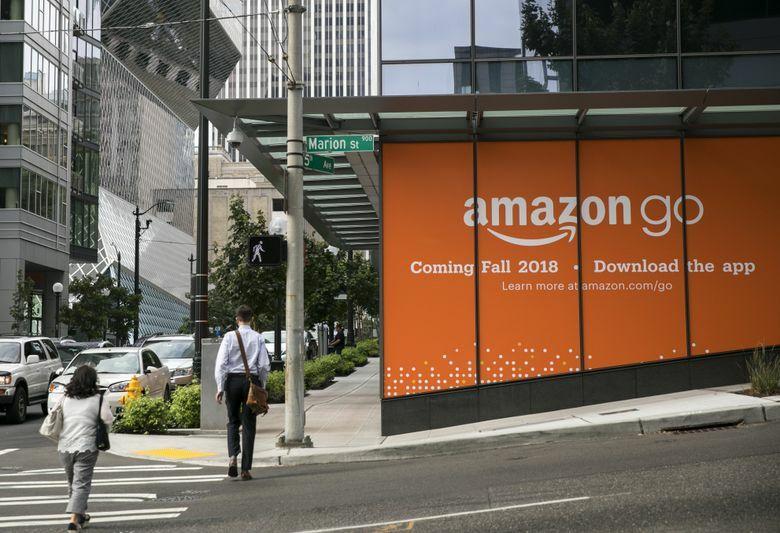 People who have visited the pilot store on the ground floor of an Amazon building will find largely the same experience at the new downtown store, near the Seattle Central Library, that opens Monday. The bright orange wrapping is coming off the new Amazon Go store in downtown Seattle, the first expansion of the cashierless convenience store outside Amazon’s corporate campus. The new store, near the Seattle Central Library at 920 Fifth Ave., opens at 7 a.m. Monday. People who have visited the pilot store, which opened in January on the ground floor of an Amazon building, will find largely the same experience at the new downtown store. Customers, who need to have the Amazon Go smartphone app installed, swipe a code on their device on the way in. At that point, Amazon’s system of cameras and sensors tracks them through the aisles, charging a credit card for items they take after they leave. That system, which relies on hundreds of cameras mounted in the ceiling, as well as human employees who check in when prompted by the system, is essentially unchanged in the new facility, Amazon says. The items on the shelves will be a bit different. Amazon packed a little bit of everything into the 1,800 square feet of its first store, from convenience-store staples like chips and drinks to limited grocery fare and beer and wine. The new downtown store, smaller at 1,450 square feet, loses the liquor aisle as well as grocery staples like milk and bread. 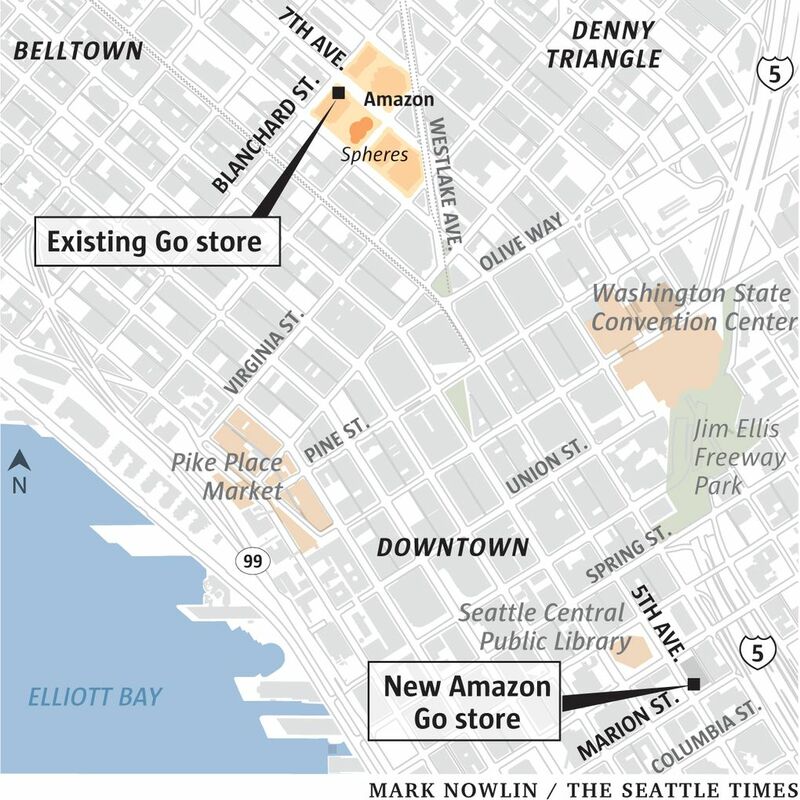 It also doesn’t have space for an in-store kitchen, and will have its fresh food supplied by an Amazon kitchen facility in Seattle. Gianna Puerini, the Amazon vice president who oversees Go, said she expects a higher portion of office workers among the clientele compared to the first store, which, while at the heart of Amazon’s office cluster, is adjacent to increasingly residential neighborhoods. “The population here is a little different,” Puerini said during a tour of the new space last week, as workers stocked shelves days before the opening with nonperishable goods like candy, gum, drinks and take-away oatmeal packs. 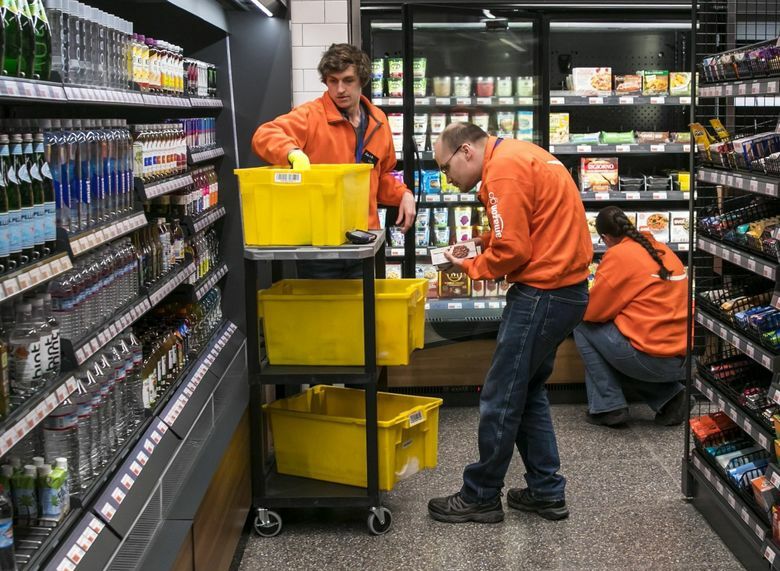 Go, along with Amazon’s Fresh grocery-delivery service and Amazon-owned Whole Foods Market, is among the Seattle company’s efforts to break into the grocery market, a massive slice of consumer shopping that, until recently, was little changed by online commerce. 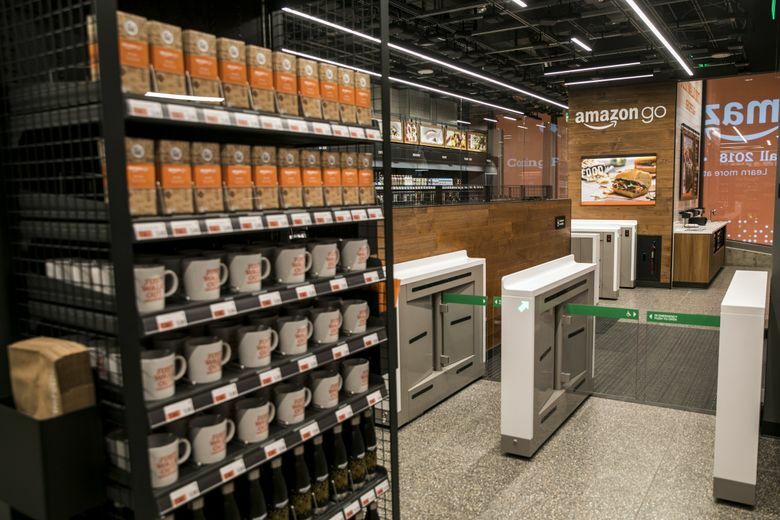 As in the original store, there’s a rack of Amazon Go-branded mugs, water bottles and other swag — items that wouldn’t exist except for the suggestion by a buyer during Amazon’s planning process that customers might be interested in taking home a souvenir. Monday’s store opening won’t be Puerini’s last. The company earlier this year confirmed plans for Go stores in Chicago and San Francisco, indicating to analysts who track the company that Amazon planned to continue to build out stores using the technology itself, rather than license it to other retailers. Puerini didn’t share the opening dates for the two announced stores, “or future Seattle” outlets, she added.